Your vacation object: The holiday house is placed on a 2000 sqm and an enclosed garden property. The property is enclosed with a hedge. Power consumption - Package - 12 Euro / per person / per week. Garbage bag / 5 Euro. Cot on request. partially enclosed plot The landlord does not live in the house or on the property. Relax outdoor at the terrace with parasol and garden furniture. The playground with swing makes children's hearts beat faster. Barbecue possibilities are available. The campfire place promises romantic evenings. Cot on request, vacuum cleaner. Internet access is available in the complex (WLAN, fees included). 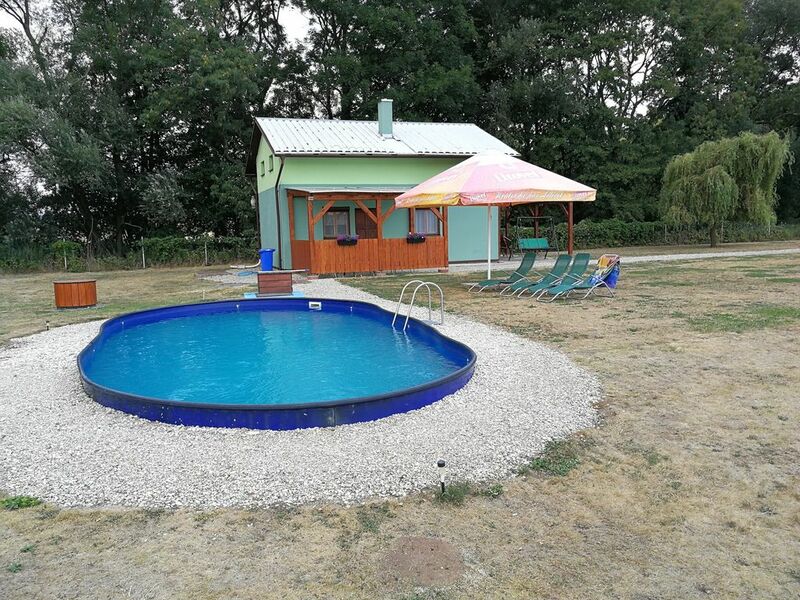 The private used pool area is open from the beginning of June until the beginning of September and offers an outdoor pool (4,4 m x 8,5 m, depth 1,4 m). Your holiday house: Your holiday house consists of 2 floors, 3 rooms (from which 2 bedrooms), is 60 sqm and can accommodate up to 6 persons. Smoking is not permitted inside the rooms. On colder days your holiday house can be heated with central heating (wood/coal). The rooms are divided as follows:Ground floor: Living room as intersecting room, 38 sqm and with dinette. The dinette offers space for 6 persons. Cooking nook in the living room with dinette, electric cooker (4 plates), oven, refrigerator (200 l, freezer), microwave, coffee machine, toaster and electric water boiler. storage room Bathroom with shower, 1 washbasin and WC.Top floor: Bedroom 15 sqm and with 1 double bed and dinette. Bedroom 17 sqm and with 4 single beds, fireplace, dinette, TV, DVD, radio and CD. In addition, your holiday house is equipped with WLAN- internet access, high chair for children and electric iron. TV or radio channel can be received per satellite. Pets: erlaubt, EUR 15.00/Tier und Woche. Ground floor: bathroom with shower, 1 washbasin and WC.